Good daily commuting jacket that's visible in all conditions, the rear light is a good touch but it'd be nice if it stayed put. 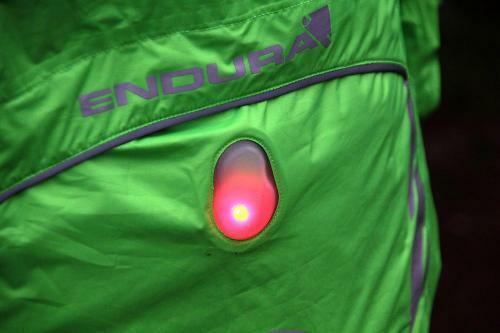 Endura's Luminite jacket has been a commuting staple for many years. The Luminite II has a fabric that's slightly thinner than the original, plenty of reflectives and a built in rear LED. It's a good choice for the daily schlep to the office. 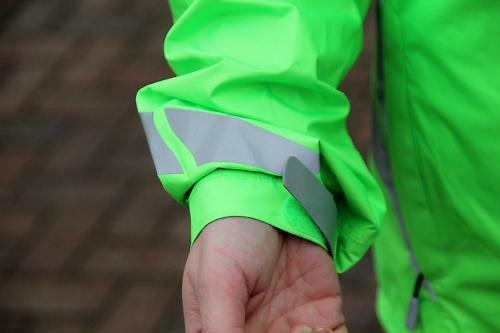 The Luminite fabric is a 2.5 layer breathable and with fully taped seams it's very waterproof There's adjustable neck and hem cords to keep the chills out and there's plenty of chevrons for great all-round visibility after dark. The green base colour (yellow and black are also available) stands out in the day, too. The generous cut means you can get a couple of layers inside, although if you're race shape you might want to size down. The thin fabric can be a bit flappy in the wind but it's not too bad, and it's surprisingly warm, mostly down to being a very effective wind barrier. If you work hard you'll find it's not the most breathable fabric out there, but for a commuter jacket it's fine. There's three pockets at the front (two side and one chest) and one at the rear, protected with a storm flap and holding the Luminite LED which shines through a translucent window. It's a good little safety addition, although I found that it wasn't too keen on staying put in its little home, wandering into the pocket on occasion and disappearing from view. The obvious comparison is with the Altura Night Vision Evo, which is similarly specced but with a slightly more luxurious-feeling soft-touch fabric and a better-located light to the rear. And a touch more reflective. The Endura is £10 less at RRP but the Altura can be had at a fairly heavy discount, so in terms of value at the till it probably edges it. They're both good options for a daily commute though. Well made, taped seams and good attention to detail. Light, waterproof and windproof. Not especially breathable. Fabric has survived fine during testing but it is thin. Good protection for the weight. You'll need a full length layer underneath or it gets clammy, but it's fine if you're sleeved up. Decent value for the quality and level of performance. Protection from the elements, visibility in all conditions. Fabric is fairly thin, light didn't stay put. 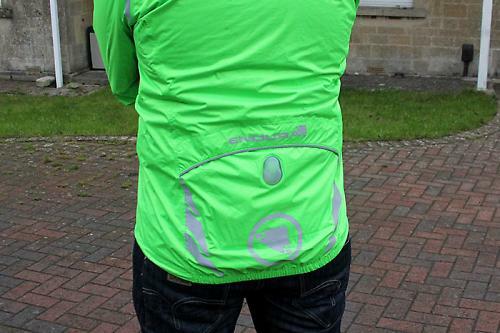 Oh my, who would want to wear a luminous lime jacket, with a macaque's arse? So that the coroner has a good laugh when the guy who ran you over claims he didn't see you. I think I saw this design on cbeebies recently. 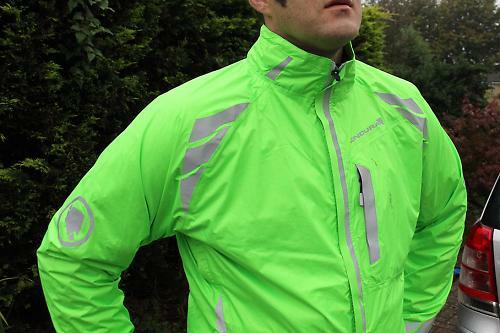 I've had the old model one of these for just over 2 years, it completely stopped being waterproof in the arms and shoulders a couple of months ago, tried nikwaxing it to no effect so took back to lbs who phoned Endura to be told that 2 years is about the life of a commuter jacket... seems crazy? I've had a black one of these since October '13. Generally good but some complaints. Very reflective with a good array of pockets - ideal for what I wanted. I agree with the comments on the light, but I have found I can reach around and switch it on whilst cycling - handy if it suddenly gets dark, like it has alot recently as the next rain storm arrives! The complaints: One small one - No protective 'garage' for top of zip so it rubs the chin a bit. One larger one. After only 4 months and one wash, the reflective patches have all started peeling off. I'm going to have to get back to the retailer or Endura about this as it is not good enough for a £90 jacket!